You are just going to have to click that link up there and see the most amazing and delicious looking thing I have ever seen. Go ahead, I’ll wait. I was already somewhat familiar with Oh She Glows before MoFo but this month Angela’s recipes have been grabbing me. I’ve put a ton of them on my recipe list and can’t wait to try them all! Scott and I made these for dinner last night and they were delicious. I love that Megan’s theme for MoFo is “Brown Baggin’ It” where she is posting lunch foods all month long. My lunches have a tendency to get very monotonous so I’m so glad I found her blog and have been making note of tons of recipes I want to try. Vegan Maple Bars? Yes, please. As soon as I stumbled upon this recipe I immediately bookmarked it and combed through the rest of Claryn’s recipes. I’m very intrigued by the Tahini Chocolate Chip Cookies and can’t wait to make a try them! I think I came across Ketty’s blog because she commented on one of my posts and boy was I glad she did. That lasagna is the stuff of dreams. I can’t wait to try it and her recipe for Cashew Cheese spread. 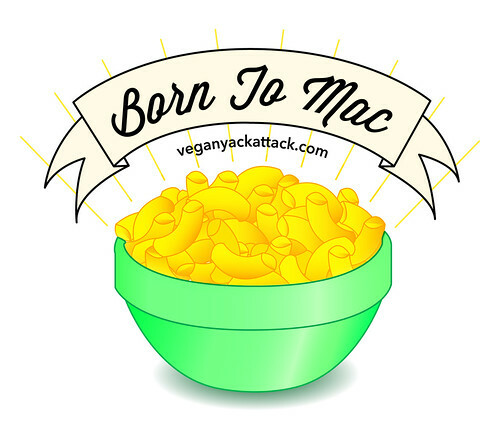 When I saw Jackie from Vegan Yak Attack’s theme, I knew i had to follow her blog immediately (I mean just look at that amazing graphic). I’m a huge mac and cheese fan. I will always order it from any restaurant that serves it on their menu. It’s easily one of my favorite foods. So I’m thrilled to see how many inventive recipes Jackie has come up with for the month. I’m super excited to try her Smokey Mac-Stuffed Sweet Potatoes and Macaroni Lasagna with White Bean Cheese Sauce. What new blogs have you stumbled upon as part of Vegan MoFo? Whoa, thanks for linking that maple bars recipe – I am drooling right now! And I made that eggplant lasagne the other night – perfect use of an eggplant I couldn’t figure out what to do with! Thanks for including me with some amazing bloggers! Those vegan maple bars look insane. And I am huge fan of Jackie’s blog. Her pictures are amazing and her food looks so good. Hey, thanks for the shout out! That eggplant lasagna looks ridiculously good (and luminousvegans has been killin’ it!). I, too, have been reading a whole slew of new-to-me blogs, which makes me really happy. Vegan in Melbourne has beautiful photos (http://rhiannonveganmelbourne.blogspot.com.au/), KZ Cakes is hilarious (http://kzcakes.blogspot.com/), and a (soy) bean has been making me drool with food from East Coast eateries all month (http://a-soy-bean.blogspot.com/). I could definitely go on!